The interest rate is the policy rate set by the monetary authority or central bank. Inflation is a measure of domestic price changes and the GDP gap is the percentage by which real GDP deviates from an estimate of its natural level. According to this rule, the policy interest rate equals 4 percent when inflation is 2 percent and GDP is at its natural level. The first constant of 2 percent in the equation can be interpreted as an estimate of the natural rate of interest, and the second constant of 2 percent subtracted from inflation can be interpreted as the inflation target. For each percentage point that inflation rises above 2 percent, the interest rate rises by 0.5 percent. For each percentage point that real GDP rises above its natural level, the rate rises by 0.5 percent. If inflation falls below 2 percent or GDP moves below its natural level, the interest rate falls accordingly. In 1999 Ireland handed control of our monetary policy to the ECB meaning that our interest rate is set in Frankfurt rather than Dublin. What would we see if we compare the eurozone interest rate as set by the ECB to the predicted rate of the Taylor rule if we applied it to crude Irish data for the past decade? 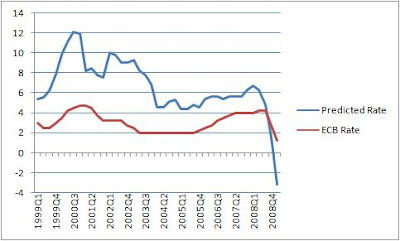 In the following graph inflation is measured using the Harmonised Index of Consumer Prices (HICP) as used by the ECB and the GDP gap is measured as the difference between the Non Accelerating Inflation Rate of Unemployment (NAIRU) as produced by the OCED and the actual unemployment rate. All data are quarterly. The result is pretty clear. For the last ten years interest rates have been too low in Ireland. The predicted rate from the Taylor rule has been an average of three and a half percent higher than the rate applied by the ECB. The rule suggests that rates should never have been set below four percent and that during the "peak" of the boom they could have been as high as 12 percent. The interest rates set by the ECB were too low and no doubt contributed to the overheating of the economy and in particular the property sector. It is also interesting to note that the Taylor rule suggests that the appropriate interest rate using the current figures is negative three and a half percent. In fact if we take the medium term forecasts produced by the ESRI that suggest HICP inflation of negative one percent and unemployment of 17 percent for 2009 then the interest rate suggested by the Taylor rule is around negative 10 percent! In the absence of monetary autonomy can we substitute one of the remaining policy instruments in our control? A General Government Deficit (GGD) of 12% of GDP would seem to fit but our huge deficit is a result of excessive expenditure funded by the now departed construction boom rather than a planned attempt to counter the economic downturn. The GGD is now a policy target rather than an instrument. Thinking back to 1979 suggests that this is deja vu all over again! What odds on three general elections in the next 24 months? Tuesday's budget from Minister Brian Lenihan was definately not a budget for people to savour. The problem is whether it will become a budget that will further lead people to save for the rainy day. It seems in Ireland that we are going to try and tax and save our way out of the recession. For 2008 the Central Bank reports (Note to Central Bank: your website is appalling!) that there was an increase in precautionary savings of about 2.5% of household disposable income. Along with changes in the labour market this accounts for the substantial drop in retail sales we have seen recently. In January 2008 Irish households had €26.6 billion saved in accounts with a maturity of less than 2 years. By January 2009 the amount saved in these accounts had risen by almost €10 billion to €36.3 billion. That is €10 billion that might have been spent and added to the circular flow had times being better. What the government wouldn't give for the multiplier effects and their share of that €10 billion had it been spent on consumer goods and services. It is also worth noting that in April of last year there was €125 billion outstanding in residential mortgages. The most recent figures for February put this at €115 billion. This reduction in debt is a form of savings and that's another €10 billion taken out of the economy. Of course the key driver of this financial indicator is the impact of new mortgage balances. The creation of new mortgages has ground to a standstill so the drop in this number need not necessarily suggest increased rates of repayment but again it is an indication of consumer slow down. It is likely that continued deterioration in the labour market will lead to further increases in precauationary savings. This is one of the features of a recession that just at a time when we want households to spend more they actually save more. The Budget is also likely to increase uncertainty and in turn peoples' urge to save rather than spend. Spending will naturally be reduced following the increases in the income levies and PRSI and the reductions in mortgage interest relief and the early childcare supplement. The full year effect of the tax measures introduced is estimated to raise an additional €3.6 billion. Remember that in two years tax revenue has fallen from €47 billion to just over €30 billion. This budget narrowed about 25% of that fall. There's still 75% to go! Obviously the gap can also be narrowed by expenditure cuts. However the Minister only announced full years cuts amounting t0 €1.2 billion. The government predicts that this year current expenditure will come in at €46.3 billion. It should be noted that current expenditure in 2008 was €44.7 billion. So even with the announced "cuts" the government is increasing expenditure rather than reducing it. The government is indicating that order can be restored to the public finances through tax increases rather than expenditure cuts. Over the next two years they have indicated they will be seeking to raise an additional €4.6 billion in taxes while cutting current expenditure by €3 billion. The government is clearly of the view (optimistic opinion?) that an upturn in the global and domestic economies will bring back the bouyancy in tax revenues that will allow it to solve the crisis in the public finance without any actual reform of the problems that got us into this mess in the first place. These are is to be considered along with likely additional increases in income and consumption taxes. To prepare for this people are going to further cut their expenditure and try to increase their savings. This is only going to add to the government's woes as more money is stowed away and economic activity (retails sales, jobs and tax revenue) will continue tracking downward. All that we will be increasing are our savings as the forecast for the rainy day just got a whole lot gloomier. At its simplest taxes can be grouped into three categories: income taxes (when you earn money), sales or consumption taxes (when you spend money) and wealth taxes (when you have money). In Ireland we use income and consumption as tax bases but the third tax base of wealth has been largely ignored. With our existing consumption and income taxes, tax revenue for the Government peaked at €47.3 billion in 2007. In the following year, 2008, the figure had fallen to €40.7 billion. The latest Government estimate for 2009 revenue is only €34 billion and without substantial changes in Tuesday's budget this figure is likely to be optimistic and I imagine that it will not be much over €30 billion. This decrease represents a collapse of tax revenue of about 33%. Not even the most pessimistic of forecasts have the economy contracting by anything more than 8% to 10%. Why has tax revenue collapsed at a speed more than three times the rate of the economic downturn? The main reason is that tax revenue was closely tied to activity in those sectors that have been hardest hit by the downturn - construction activity and property sales. For example in 2007 stamp duty receipts were €3.2 billion, in 2008 this had halved to €1.6 billion. Early indications for 2009 suggest that stamp duty revenue will be below €1 billion. Almost 80% of stamp duties come from property sales. Similar patterns can be seen for income tax, VAT, capital gains tax and other receipts from the construction and property sectors. Over the last few years we have used these transitory revenues as if they were permanent and have expanded the public service such that it now costs roughly €50 billion to pay for the day-to-day running of the government and public sector. When revenue is over €47 billion this is not a problem. As the windfall taxes from the property sector have now dried up and revenue will be no more than €34 billion we can see that there is a huge "hole" in the public finances. When we add in long term or capital expenditure of about €10 billion the gap between revenue and expenditure for 2009 could be in excess of €25 billion. At the end of 2007 our total National Debt was just €37 billion. By the end of this year it could have doubled in just two years and will continue growing rapidly in the medium term. In 2007 the level of economic activity in Ireland as measured by GDP was just over €190 billion. The €47 billion tax take of the government was about 25% of that. This is low by international standards so we do not pay a lot for government in this country. The average in the 30 or so richest countries that make up the OECD was 36% with rates of 50% in Sweden, 38% in the UK, 36% in Germany and 28% in the US. The collapse in tax revenue will see this ratio head towards 20% for 2009. Clearly there are long term structural problems in Irish budgetary procedures that allowed the temporary tax revenues of the construction boom to be considered permanent. A time of crisis is not the time to be undertaking a radical overhaul of the system but the simple fact is that we are not paying enough tax. In fact about 40% of workers pay no income tax, though they do pay the levies. In the space of two years the amount of tax we are paying has fallen by over €15 billion a year. This is money that the government was collecting from tax payers. As the source of much of the revenue has dried up (the construction and property sectors) our taxes have to be rebalanced in order for revenues to rise. There should also be continued adjustments on the expenditure side to row back on the increases in pay and size of the public sector that were financed by the now departed boom. On the tax side it must be decided who will shoulder the burden and whether the taxes will be on income, consumption or wealth. Increases in income taxes are inevitable but most people would prefer to be paying income tax than face the unemployment alternative. We are unlikely to see significant changes in consumption taxes as our VAT rates are already high when compared to the UK but there may be some increases in some specific excise duties. The use of wealth as a tax base of has been missing from the Irish tax system since the abolishment of the short lived Residential Property Tax in the mid-1990s, but maybe it is time for us to reconsider wealth taxes. This may mean the re-introduction of a property tax. Although house prices are falling they are still significantly ahead of where they were a decade ago and many people have seen a significant rise in their net worth. One danger of introducing a property tax is that it will simply place an unbearable burden on those who got on the property ladder in the last few years and have paid huge amounts of money for their home. A significant portion of the cost of a new house goes to the government (upwards of 25%) while buyers of second-hand homes will have paid stamp duty of tens of thousands of euro. These buyers are trying to pay off substantial mortgages that in many cases are now greater than the value of the houses as the spectre of negative equity has become a reality. Although these people "own" their home they are not wealthy and in buying a house have already contributed heavily to the Exchequer. If a property tax is going to be introduced it should be a tax on actual wealth rather than on simply owning an asset. Owning an asset does not make you wealthy if you have the matching liability of a mortgage. We tax income not work and buying goods rather than using them. Although we have work and consumption taxes we only tax work when it generates income and consumption at the point of sale. If we are going to introduce a wealth tax it is important that the tax actually targets wealth. Imagine a work tax that imposed a tax liability on the work of cutting the lawn or cooking the dinner! A second problem with a property tax is people who are asset rich but cash poor. These are mainly older or retired people who continue to live in the family home that can be worth hundreds of thousands of euro. However, their pension incomes may be relatively low and the imposition of a property tax may place a burden on them that is impossible to meet from their income. This may force some people to sell their home in order to pay the tax and this is a distortion that should not be caused by the tax system. Taxing flows of money with income and consumption taxes is relatively straightforward and people only pay tax if they actually earn or spend money. We have seen that this is not the case with taxing wealth but that means that the introduction of a such a tax has to be carefully considered rather than just dismissed.